To celebrate the life of our beloved colleague, mentor, teacher, and friend, Prof. Pius Adesanmi, the family hosted a service at The Metropolitan Bible Church, Ottawa. 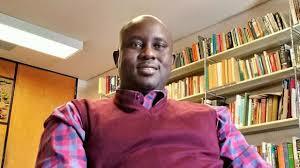 Carleton University is devastated by the sudden death of Prof. Pius Adesanmi, director of our Institute of African Studies and a remarkable writer, poet and political commentator who was celebrated for his eloquence and fearlessness in speaking truth to power. His award-winning book – You’re Not a Country Africa: A Personal History of the African Present – was groundbreaking. One of the most important minds of the African diaspora, he inspired his Carleton colleagues with his brilliance and cemented his close ties to faculty, staff and students with his kindness, thoughtfulness, enthusiasm and unforgettable laugh. To honour his memory a fund has been established which will support students and continue his life’s work. You may share your memories of Prof. Adesanmi by submitting a tribute here.